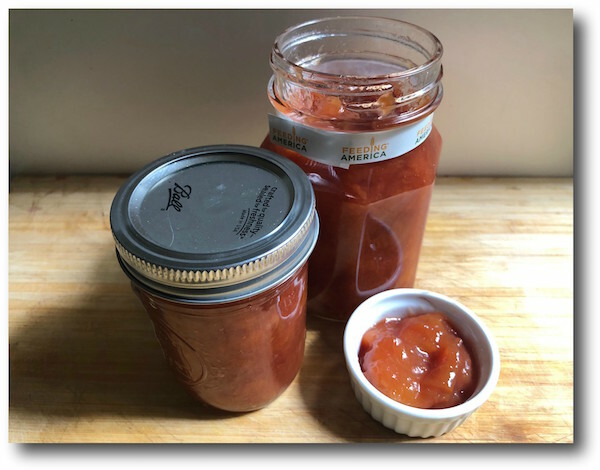 I’ve made peach jam several times, thanks in part to an annual delivery of peaches courtesy of the Washington Stone Fruit Growers, but I continue to look for ways to simplify the canning process. Standard peach jam recipes call for a lot of sugar and some powder or liquid pectin. The result is good, but can be a bit on the sweet side and a little rubbery. My preference is for a softer jam with less sugar and frankly less fuss. I wondered if there might be a way to make jam without bothering with the tedious job of peeling peaches? It turns out, there is. The key to this recipe is the peels. Lemon peel and peach peel are high in pectin and so if you cook the peaches with them, you won’t need to add any additional pectin. I started with a recipe from A Sweet Spoonful, but the main difference was I skipped peeling the fruit and used the lemon peel as well as the juice. I added some slices of fresh ginger in my first batch but I didn’t find it added much flavor so I’m skipping it. You could certainly add some powdered ginger, candied ginger or even scraped vanilla bean if you like. This jam is in between jam and preserves. It has some skin in it, but it’s silky smooth and doesn’t detract from the texture or flavor of the peaches. The pureed skins add a pretty rosy tint. How much you puree is up to you, I estimate I pureed about 1/3 cup or so. Note: You could can this in half pint or pint jars. I used a combination of both. Fill a canner with water and bring to a boil. Place the jars in the canner and boil. Put a small plate in the freezer so you can test the jam later. Place the peach chunks in a large non-reactive bowl. Sprinkle with sugar and lemon juice. Don’t stir–just let the sugar sit and macerate, this helps to release the natural juices of the fruit. 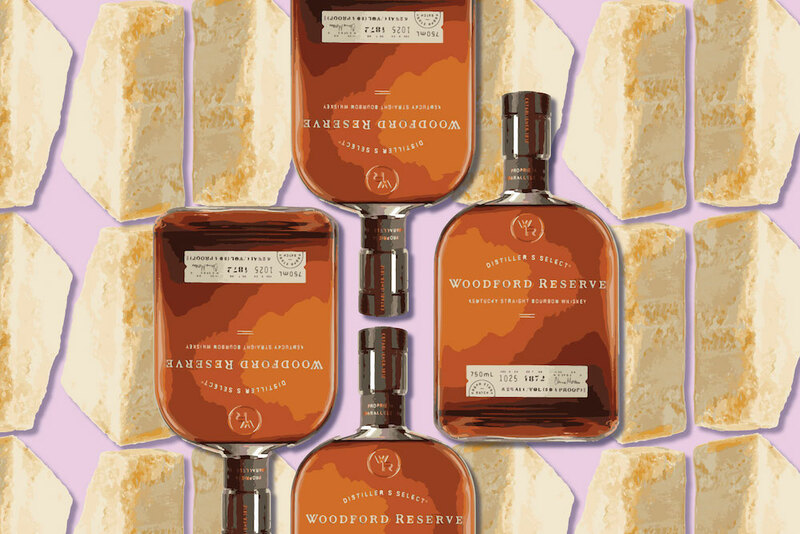 Allow to sit at room temperature for 1-2 hours. Add the fruit along with the lemon peel to a large pot and bring to a boil. Using a potato masher mash the peaches. Continue stirring the peaches as they cook, using a wooden spoon. After about 10 minutes skim as much of the peels out of the pot using a slotted spoon and puree them in a blender then add them back to the pot. Remove the lemon peel and discard. Continue cooking until the mixtures thickens, about another 20 minutes. Test the thickness by placing a teaspoon full of the jam on the chilled plate and let it rest for about 30 seconds. Run your finger through the dollop and if it stays separated where your finger was, it’s thick enough. Lift the jars out of the canner, pouring the hot water back into the canner. Ladle the jam into the jars, leaving 1/2 inch headspace. After filling the jar, release the air bubbles by inserting a narrow silicone spatula or similar tool between the jam and the inside of the jar. Place the rims on top of each jar and loosely seal with the bands. Carefully place the jars back in the canner and process/boil for 10 minutes. Remove from the canner and let rest overnight, you may hear the lids pop. Store for up to one year. Disclaimer: Peaches were provided to me as part of the canbassador program by Washington State Stone Fruit Growers and to Ball Home Canning for the jars.